With a title like that – and that cover – surely I would have cottoned on to the fact that this book has to do with meat. As in meat that comes from animals. Specifically cows. But yeah I didn’t quite get it until I opened the book. It is an anti-meat story. A book you don’t want to eat a hamburger with. A book that you shouldn’t take out for a steak dinner. Not a wining and dining sort of book. In fact it is a book that should stay far away from your kitchen, dining room!, breakfast nook, patio table or anywhere you sit down and consume things. Because while it is fictional, it is also full of uncomfortable facts about the meat industry. But before you run away screaming, My Year of Meats is also the tale of two women, Akiko Ueno, who lives in a Tokyo suburb and is married to a BEEF-EX exec, and Jane Takagi-Little, who produces the TV series sponsored by those very meat exporters for Japanese housewives like Akiko. My American Wife is its title and meat is the message. Pork is possible! Beef is best! The narration switches between Jane and Akiko. Akiko suffers under the thumb of her ogre of a husband, taking her revenge in her own way by throwing up her meals and discouraging her body from having babies. But her forced viewing of My American Wife becomes her lifesaver, her eye-opener to the unhappiness in her life, and as Jane takes over the direction of the show, it becomes, more honest, less staged, and also less about the meat recipes (beef fudge!) and more about the people, and such diverse people she digs up too. And the more Jane learns about the meat industry the more convinced she is that meat is indeed the message, just not the way the beef company expects it. Then, at the pancake breakfast where we had been filming, a red-faced veteran from WWII drew a bead on me and my crew, standing in line by the warming trays, our plates stacked high with flapjacks and American bacon. “Where you from, anyway?” he asked, squinting his bitter blue eyes at me. “No, no… What are you?” He whined with frustration. My Year of Meats was both funny and uncomfortable. Kind of like that passage above. I’m not sure how Ozeki managed to straddle those two but it did. She drew up some great characters in Jane and Akiko, and even Jane’s crew members and the “American wives” she interviews. There was something rather fresh and interesting about this book, although, yes, I do realize it was written in 1997. And I kept having this feeling that I was reading an actual person’s story, a memoir, not fiction. I guess that means that the characters, the story, felt very real to me. This probably had to do with the fact that Ozeki herself is half Japanese, half Caucasian, and worked for several years making documentaries. 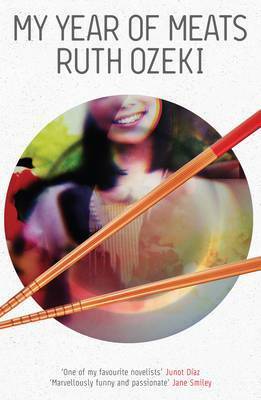 What I’m trying to say, in my clumsy, half-awake way, as the baby monitor carries my kid’s cries from his crib to my kitchen, is that this was a read that struck me, that kept me turning the pages, despite some of the gruesome scenes and uncomfortable knowledge, that Ozeki’s writing and characters pulled me in. And that I will be looking out for the rest of Ozeki’s books. My Year of Meats. Penguin. 1998. All Over Creation. Penguin. 2003. A Tale for the Time Being. Viking. 2013. I listened to this years ago and had a similar reaction. You might want to give All Over Creation a try, too. I have a copy of A Tale for the Time Being, but just haven’t been inspired to pick it up… yet. I really want to read more from Ozeki. Soon I hope! 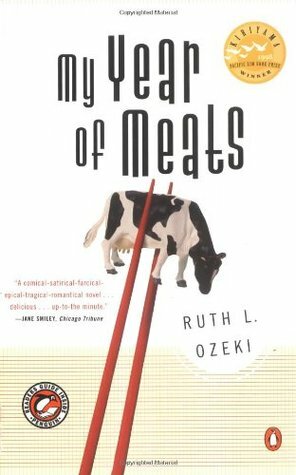 I read My Year of Meats earlier this year – it’s very original and I can’t wait to read All Over Creation next.